I’m back! I didn’t mean to leave, and definitely for not this long, but it’s been a crazy past few months and blogging fell by the wayside. It started with a coworker leaving and having to cover two positions until just a few weeks ago. All while I studied for the GMAT, took the GMAT, and applied to business school (keeping my fingers crossed!). Needless to say, I've had more fun summers. Oh, and I moved. After five years in my tiny studio, I made the leap to a rowhouse on Capitol Hill. I have two awesome roommates and am SO enjoying having actual space. We have a dining room, normal-sized kitchen, working fireplace, a huge basement (hello, storage! ), and a backyard. The neighborhood is perfect for me right now - more quiet and residential yet still right in the middle of everything. There are even families here. Like, with actual small children. We have mums on our stoop. There were trick-or-treaters on Halloween. I can't get enough. Speaking of my normal-sized kitchen, I’ve slowly been learning my way around, getting organized, and finding my new rhythm. In the chaos of moving, I barely cooked for over a month. I couldn’t jump back to The Kitchen Holiday with some rushed weeknight meal, so this weekend I concocted a perfect fall, gluten free dessert. It’s not too sweet and has a nice blend of oats, nuts, and fruit, so you can, you know, eat it for breakfast (I won't pretend this didn't happen. Twice.). First we'll tackle the crust. Instead of a thin pastry crust, I opted for a hearty, oat-ey, almond crust. Start by making oat flour. Pour ½ cup of gluten free oats into the food processor and blend on high until they've reached a flour consistency. Pour the flour into a separate bowl and prepare the other crust ingredients: coconut oil, maple syrup, oats, salt, and almonds. Add the oat flour, salt, coconut oil, and maple syrup, and blend them until they stick together. Add the remaining oats and blend they're just combined into the "dough," but not so much that the oats are all chopped up. Press the dough into a pie plate with your fingers. If your fingers stick to the dough, just get them a little wet. I used a shallow 9 inch pie pan because I was worried there wouldn't be enough dough, but there was more than enough. It easily would have fit into my deep dish pan. Next we'll make the filling. 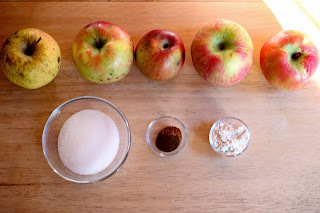 We'll use 5 medium sized apples, sugar, spices, and gluten free flour (I used gluten free baking mix). My apples were left over from some that my parents grew in their yard (I'm starting to think it's closer to a homestead than a yard, actually) and some I received in my farm share over the summer. They weren't the prettiest on the outside, but once I peeled them they were just fine. Peel and core the apples and then slice them very thinly into a large bowl. Add the sugar, flour, and spices. I used cinnamon, nutmeg, and cloves, but you could also just use cinnamon if you prefer. Toss it all together and pour the fruit into our awesome shell. Finally, we'll make the crumb topping. I used gluten free flour, white and brown sugar, pecans, oats, salt, and butter. Using a pastry blender, mix all the ingredients until the butter is the size of small pebbles. It will all melt together in the oven to a crispy goodness. If you don't have a pastry blender, you can always use two sharp knives instead. Pour the topping over the apples. The apples will cook down quite a bit in the oven, so don't worry about it being too high. You'll have to carefully add the topping, but it will all come together nicely. Bake at 400 degrees for 40-45 minutes, or until the crumb topping is golden brown and the apples are soft. As you can see, the edges of my crust got a little too brown, so I'd recommend cutting strips of foil and placing them over the edges of the crust while your pie cooks. Either way though, it will still be delicious. Eat it right away while it's warm, possibly with a scoop of vanilla ice cream. The great thing about this crust is that it gets better after it sits for a while. Immediately after baking I found it to be a little on the dry side, but the next day, after all the delicious apple juices have soaked through, the pie was even better. I think this will depend on how juicy your apples were. Mine weren't very juicy, but if yours are, the crust might be perfect as soon as it comes out of the oven. Let me know how it goes! I'll definitely be making this come Thanksgiving, but if I'm being honest I'll probably be making this continuously throughout the season. Blend ½ cup oats in a food processor until the consistency of flour. Remove to a separate bowl. Add the almonds to the food processor and blend until they resemble coarse sand. Add the oat flour, salt, oil, and syrup and blend until combined. Add the remaining one cup oats and blend until just combined. Pour into 9 inch pie pan and press into the sides. Set aside. Peel, core, and slice the apples. Mix in a large bowl with sugar, spices, and flour and toss until combined. Pour into prepared pie pan. Combine all ingredients into a medium bowl and mix with a pastry blender until the butter resembles small pebbles. Carefully pour over apples. Cover the edges of the pie with foil. Bake at 400 degrees for about 45 minutes, or until the topping is browned and the apples are soft. Cool slightly before serving.